I read this article and found it very interesting, thought it might be something for you. The article is called How to Make SEO Friendly URLs in WordPress and is located at https://wpsoar.com/how-to-make-seo-friendly-urls-in-wordpress. Why does the URL structure matter for my website? How do I customize my URL and should I care if its SEO friendly? SEO is a broad and very large topic. 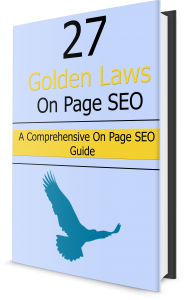 There are many things that go into a site that has good on page as well as good off page SEO. In fact, there are over 205 search engine ranking factors that go into SEO. Doing this trick alone, will help, but it will not make or break your overall ranking. Incorporating a full and consistent SEO regimen is the only proven way to help with your rank on the major search engines. Unfortunately, there is no one, magic bullet that will get you ranked overnight. SEO takes time and effort. It is the utmost importance to provide high quality, consistent content that is relevant and reflective of the target keyword that you select. With that said, this is one of the consistent tactics you can employ on your website to help with your on page SEO. Make sure in the URL you choose to include your “target keyword”. A target keyword is ultimately the foundation for your SEO strategy. Make sure before you choose any random keyword that you choose a keyword that you researched so you optimize the correct keywords. There are many tools I can help you verify the target keyword in the amount of traffic that that keyword may generate. One of which is the Google Adwords Keyword Planner. This tool is invaluable for keyword research and gives you an estimation of how much traffic you may expect from ranking on the keyword. What qualifies a URL as SEO Friendly? A poorly structured URL that is hard to read would look something like https://www.wpsoar.com/?q=5632846. Having nonsense characters following your main you’re out that could be a string of numbers, or letters serves you no purpose for SEO. It has no benefit to your post or page as far as rank. Google requires to read the article by scanning the code in order to identify the target keywords of that article. This just makes it more difficult for you to rank. Bad SEO URLs also have inconsistent naming schemas and are just randomly generated junk by an engine. Random extra strings or characters following the parent URL can become very problematic for the search engines because they cannot gauge the importance of a particular post or page. Where is it nested? What has more importance, the category or the post? This is especially the case when the URL is nested in random folders and sub-folders that have no relevance to the actual keyword target of the post or page. Google and other search engines, cannot read your mind, and therefore will have a very tough time understanding the site structure and site map as a whole. WordPress has the ability to change the structure of the URLs or Permalinks to be SEO friendly. It is nested in the Permalink settings and requires adjusting from your stock blog. All URLs in WordPress can be customized too. A good rule to keep in mind is keep your URL short, concise and relevant to your keyword. At best, you want to match your permalink to your targeted keyword. An SEO friendly URL has keywords that are easy to read by search engines and humans and allow you to ultimately get more traffic. Using the name of your post in your URL is the most friendly structure you can use. For example https://www.wpsoar.com/205-reasons-your-wordpress-seo-is-doomed/. Generally, the purpose is to match the URL friendly version of your post or page (permalink) to your page or blog title. They’re of course many other facets of SEO they need to take place. But, this is one of the easiest methods that can be implemented almost immediately on any blog or website. In general, you need to select the keyword that you were choosing a target keyword, and then include that keyword in your permalink. It doesn’t really matter if your article is nested within a date, or a subcategory, or anything else. So long as that you have the relevant targeted keywords in your URL somewhere. This is ultimately the most important piece. Anything preceding the URL targeted keyword is only up to you on how you want to organize your site. So long as the link structure makes sense from a hierarchical perspective. The post or page should be nested in the appropriate hierarchy. In other words, everything that has the same category is nested in the same location in your permalink structure. Like https://wpsoar.com/205-reasons-your-wordpress-seo-is-doomed. Everything nested in “category” should be consistent and have the right parent category, and not contain extraneous child categories. The goal is to develop a consistent URL schema. This is where you can add your own custom structures or use one of WordPress’s pre-defined URL naming structures. Any of these options are just fine, except the default setting. The default setting just uses the page or post’s database ID associated with that page or post. Even worse, you are giving away that ID within your database associated with the post or page! This can actually help hackers figure out your database structure and how many entries exist within your database. The best is to change this default setting to something a bit more SEO friendly. Once you get the hang of identifying target keywords and focusing in to SEO friendly URL structures this will come easy to you. In fact, WordPress pretty much generates this for you. All you have to do is ensure that you’re adding the right title to each and every post or page. WordPress will automatically create your permalink defined by your URL schema that you set up. What’s your opinion on SEO Friendly URLs? Please comment below.